CHIPOTLE night fundraiser - Enjoy dinner at Chipotle, 17 Chaplin Road in Morgantown, WV between 5:00pm and 9:00pm on October 1st and 50% of your bill goes to Loving Daniel. Just mention Loving Daniel when you check out!!!! Our 2nd Annual Loving Daniel Calendar Party!!!!! Email us if you are interested in tickets to attend. It promises to be a fun day celebrating Daniel's life as we raise money to help other grieving families. APPLEBEE'S DINE TO DONATE - Present our Dine-To-Donate flyer when you enjoy a meal any time on Oct 29th at Applebee's in Uniontown, PA. We earn 15% of your bill. The flyer can be found on our Facebook Page after October 1st. The Cuddle Cots are made by one company, Flexmort, which is located in the United Kingdom. All the parts come in a large box with a handle for easy transporting. The cooling unit attaches to the cooling pad via a set of tubes. There are two cooling pads that can be used, one for preemies and one for babies to term. S.O.B.B.S (Stories of Babies Born Still) is a non-profit group based in Lakeland, Florida. They began the U.S. Cuddle Cot Campaign from their grief of losing a child. Their goal is to help place a Cuddle Cot in every delivering hospital in the United States. We are working with them for our Cuddle Cot placements. Our first Cuddle Cot that was purchased and donated to the Uniontown Hospital on March 31, 2016. We held our 1st Annual Calendar Party on September 10, 2015. Approximtely 150 people attended the event which made it a huge success. We are so thankful for all those who hosted tables, donated auction items, and attended the event. 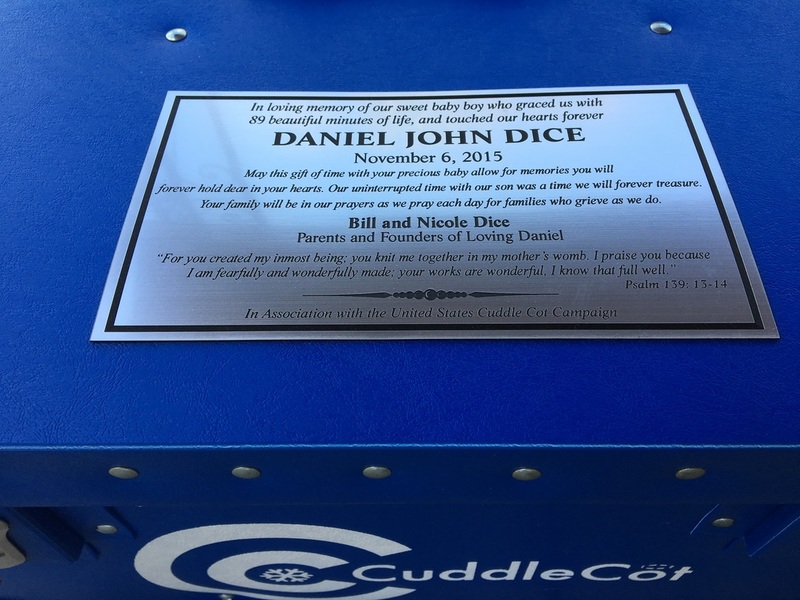 The money raised at the Calendar Party purchased our third Cuddle Cot of the year and will fund the Annual Daniel John Dice Memorial Scholarship. We appreciate all monetary donations to help fund our efforts of giving support to other grieving families. Donations can be made safely through the link at the top of this page. Please visit our Contact Information Page to request further information on how to make a tax-deductible donation to Loving Daniel.